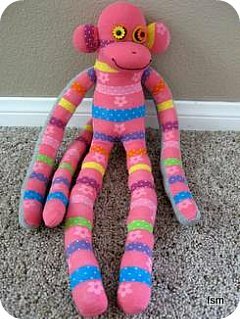 This pink sock monkey was made with stuffed knee high socks with dots and stripes. 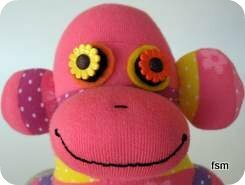 She has fun flower button eyes in yellow and orange. 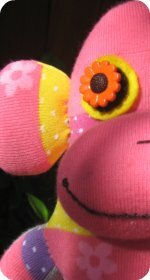 Her little sockmonkey face is quite cute really! 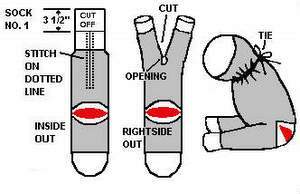 When you are making a sock monkey out of knee high socks all you have to do is follow the basic sock monkey pattern and it works out just the same as a regular monkey (out of shorter socks) except that it will have longer arms, legs and tail. 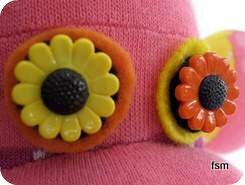 Eyes: Cut a black felt circle, a larger yellow circle, then cut a very small hole in the center of each circle. Place the black circle on top of the yellow and put the back loop of the button through the holes. Stitch to head. Repeat above for the other eye, using black and orange felt. Ears: Sew together, stuff generously and that's it. The ears stay really puffy when there is no added embroidery. Stitch on a mouth and nose with the black embroidery thread. Note: Please ignore the gray on the underside of the sock monkey's arms, I made a boo boo with the scissors and accidentally cut a part of the pink sock I was not meant to. So, I had to do a patch up job. Whoops, oh well never mind! Being creative and going with the flow is all part of it, mistakes quite often lead us in new directions and help us create something unique. 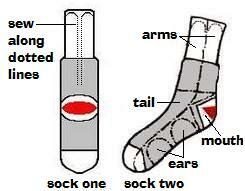 Make sure you use the sock monkey patterns as guide lines not something you need to strictly follow, go crazy, make up you own kind of sock creature. TIP: When making eyes with felt and buttons with loops on the back, the process is made so much easier by cutting a small hole in the felt for the loops to push through. 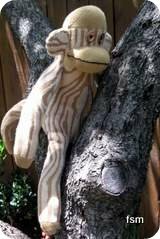 You can alter the monkey pattern slightly to make other animals. Example: Make a stuffed rabbit by making long pointy ears (attached to the top of the head, no the side) and make shorter arms and legs. You can make anything really, it's just a matter of being creative.